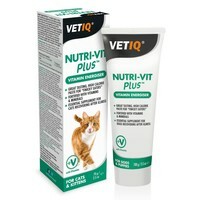 This paste works & is well received from my very fussy cat! I bought for a 12 year old cat who randomly developed food allergies to almost everything a year ago, so I placed her on a Hills prescription allergy diet which worked, but I noticed her fur became really coarse & sparse on her body. I wondered if she wasn't getting the right vitamins from her allergy diet alone, so tried adding this. Her coat is now becoming more soft and full again and she enjoys eating it squeezed on top of her special dry food & it doesn't appear to trigger her allergy thank goodness!